We have responded to State Senator Andrew Lanza’s hateful announcement by putting up another billboard in Lanza’s own district (Staten Island). The billboard is a digital board and went up late Wednesday night. We are putting this board there as a challenge to Senator Lanza. He claims to have been so offended by the first board that he was willing to call for a boycott of Times Square, where it was located. We are challenging him to call for a boycott of businesses in his own district to see if he really means what he says. Cranford, NJ—On Thursday, American Atheists, whose Times Square billboard has been under petition for removal by New York State Senator Andrew Lanza since Friday, December 13, stepped up their advocacy by displaying a similar billboard on the Goethals Bridge to Staten Island, the district which Senator Lanza represents. On December 13, Senator Lanza issued a press release expressing his outrage at the group’s Times Square message, calling the billboard “hate speech” and “religious persecution of the kind that similarly lead to the Holocaust” and even called for a boycott of businesses in Times Square. 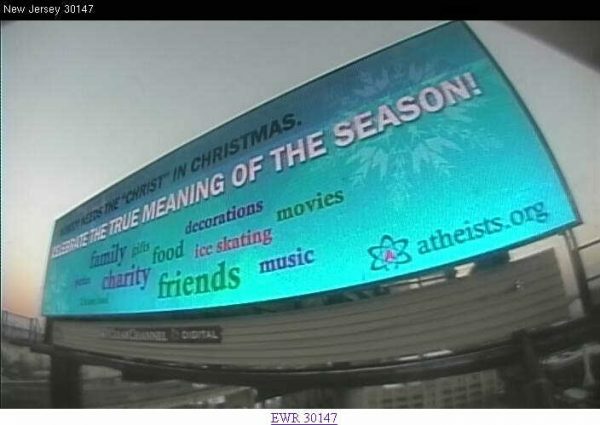 The digital billboard, a fifteen-second animation, begins with “Who needs Christ during Christmas? Nobody.” The animation continues with “Celebrate the true meaning of Xmas,” and a word cloud including traditions such as family, friends, food, and charity. The animation ends by wishing “Happy Holidays” from American Atheists. Lanza’s non-profit status threat against American Atheists comes just months before the organization’s annual national convention, to be held Easter weekend in Salt Lake City for 2014. American Atheists’ 40th National Convention will feature such speakers such as NFL star Chris Kluwe, Survivor®: Philippines grand prizewinner Denise Stapley, Grammy-nominated Spin Doctors bass player Mark White, Reverend Barry Lynn of Americans United for the Separation of Church and State, Maryam Namazie of the Council of Ex-Muslims, popular bloggers PZ Myers and Greta Christina, and American Atheists President David Silverman. The convention will also feature a costume party, live music, stand-up comedy, an art show and silent auction, national and local exhibitors, and childcare options for attending families. The convention takes place April 17-20, 2014. American Atheists grants permission to reproduce and redistribute these images so long as they are not cropped or edited and credit is given to American Atheists for providing them. American Atheists grants permission to reproduce and redistribute this image so long as it is not cropped or edited and credit is given to American Atheists for providing it.